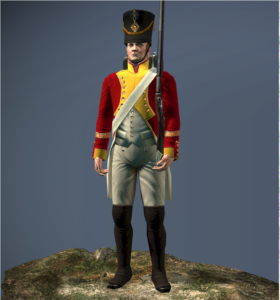 As line infantry they are a relatively versatile force for their general, and can be relied on to stand and fire, or give a good account of themselves in close combat. They are, of course, vulnerable to artillery fire, and can suffer if left exposed to skirmishers. Against cavalry, they can quickly form square, and then withstand an attack. The Swiss have a long tradition of serving in foreign armies, as long as the money was there. The saying “No money, no Swiss” dates back to at least the Renaissance, when Swiss mercenaries were regarded as among the best in Europe. When paid, there were no fiercer soldiers. By the Napoleonic era, Swiss units were exclusive to the French army and the Papal Swiss Guard of the Vatican. At the Battle of Berezina, the Swiss covered the French retreat under fire from the Russians, and this brave service was immortalised in the song “Beresinalied”. A drill school trains soldiers to obey standardised military procedures. It also allows military units to be recruited.